Work on this new title proceeds, if rather more slowly than we had hoped. An update on progress is long overdue . . . The artist Hugh Buchanan was born in Edinburgh in 1958 and educated at Edinburgh College of Art. After completing post-graduate studies ‘with distinction’ in 1981, he was awarded travel scholarships to the Middle East and, later, North Italy and the Balkans. Since then he has travelled regularly throughout Europe to visit and paint in watercolour buildings and interiors from the Renaissance to the Baroque. His commissions have included work at Balmoral, Highgrove, and the Palace of Westminster, and amongst his exhibitions one can list those at the Museo de Bellas Artes in Bilbao, the Lincoln Centre in New York, the Palace of Holyroodhouse in Edinburgh, Queen’s Gallery in London, and a major retrospective by the National Trust at Petworth House. 1,600 A2 sheets of Somerset paper arrived a while back and we have started printing Hugh's watercolours. Each sheet needs to be individually fed to the latest Epson printer to find itself attached to my PC. So things go slowly. But once the watercolours have been laid down I can start the letterpress. The author of the texts, Peter Davidson, is Professor of Renaissance Studies at the University of Aberdeen. His prose book The Idea of North published by Reaktion in 2005 was widely and positively reviewed. Carcanet published his collection of verse The Palace of Oblivion in 2008. He and Hugh have collaborated before: in 1994 they published The Eloquence of Shadows, a volume of architectural meditations. 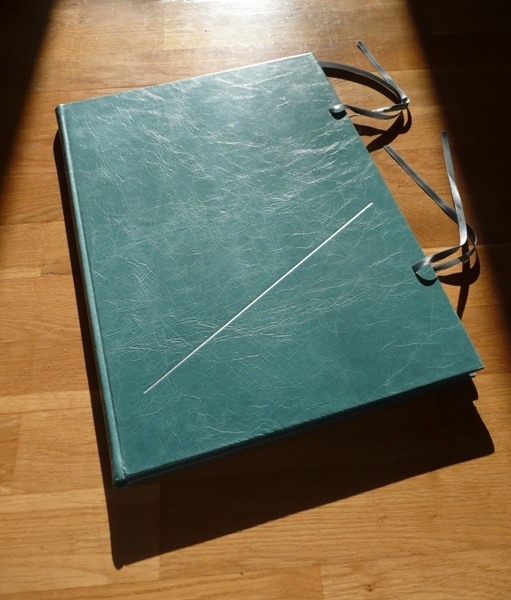 I shall of course have the trial binding on display at the Oxford Fine Press Book Fair this coming weekend (see below). Hugh's watercolours are beautifully observed, and, to increase my enjoyment at least, most portray a book or paper somewhere in the scene. There will be 100 copies for sale with a further 25 not for sale. We are offering a pre-publication price of £220 (€270, US$370) for those who would like to be sure of a copy and are happy to pay now. The price on publication will be £275 (€330, US$450). Subscribers to the Press will receive their usual 15% discount on either price. (Shipping is charged extra at cost as usual. Euro and dollar prices might change with exchange rate fluctuations.) I hope to send out a small brochure shortly. Just one week to go before the biennial Oxford Fine Press Book Fair at Oxford Brookes University. I don't need to say what a great event this always is. For full details go to the FPBA website - you will find all you need to know about when and where it is, the lectures on Sunday, the prizes, and all the exhibitors. We shall have on display two new books published since the last fair: Palladio's Homes and An Italian Dream - as well as the trial binding of Winter Light. And here's something for your 2010 diary. Josie Lawrence has been a great supporter of fine press books over the years, hosting several exhibitions at her Chapel Row Gallery in Bath, England. From 13 February to 2 March next year the FPBA will be presenting the work of fine presses at the gallery. More news as it comes in. Meanwhile, if you are a press and would like to exhibit please let me know.